Is your work no longer serving you? Is it time for a change? This session will highlight the different phases of a career change if you decide this might be the route for you. You’ll learn how to begin the process, create a vision, explore the options, build your plan and navigate to get to where you want to be. Career change can be defined in several different ways. You’ll learn about the types of changes and what may work best for you. 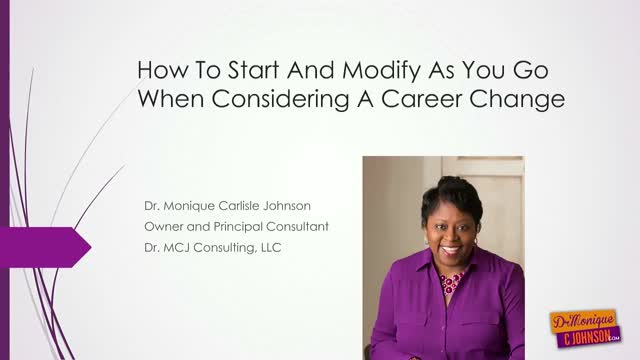 This session will benefit you if you are a millennial or 50 considering a career change. There’s no magic formula and it varies based on the individual, but this session will definitely give you practical strategies to consider when making a big change. I welcome all of your questions at the end of the session. Don’t wait until you’re miserable and hate your job. How to determine if a complete career change is the best move for you. How to modify the goals and vision for your life. Strategies to help you explore your options. Making a decision and planning your next moves. Strategies for researching your potential career and/or employers. Executing the plan using traditional and nontraditional strategies.